Three weeks ago, on August 30th, I posted pictures of about a dozen Monarch caterpillars munching on milkweed leaves, like the ones shown below. A few days later, they all disappeared. I suspected the birds ate them because I saw some birds diving toward the milkweed and then flying away. I thought that was the end of that Monarch generation, and promised myself to hang some kind of netting next year to keep the birds from consuming the caterpillars. This morning, I saw one Monarch caterpillar attached to our house siding, about four feet from the milkweed plants. It was busy weaving and by noontime had transformed itself into a Chrysalis. To prevent the birds from eating it, I hung a piece of transparent plastic around it, with openings on three sides. In 10 days, a Monarch butterfly will emerge from the above Chrysalis. I will try to be there to capture that moment. Wow, I have to say even the caterpillar is quite beautiful too ~ in part because of your shallow DOF it really pops on the leaf. Great shot. I hope you are having a good start to autumn. Thank you Randall! I may be able to post more pictures of a butterfly emerging out of the chrysalis in a day or two. It is coming along fine, and as of today it is still okay. I will post pictures if I can catch the Monarch butterfly emerging from the Chrysalis. Yes! Sharp eyes and success! I remember the post about the caterpillars. I’m happy for you – and for the monarch. It will be wonderful to see the process, and you should be able to catch it, because you’ll see the changes begin when (if I remember right) the chrysalis begins to darken. I probably already told you, but years ago (in New Jersey!) I brought a caterpillar inside, with plenty of milkweed leaves, and watched the entire process. It was before the internet and i didin’t know how long the process took, so it was very suspenseful. It all turned out well and I was able to do it one more time, when I lived in Westchester. These days I might hesitate, being afraid I would interfere since they are getting scarce. But both times it went off without a hitch, and I safely released the butterflies. Those fresh wings are brilliant, but my favorite thing might have been the little spots of gold on the chrysalis. Enchanting. Next year I will follow your example and bring at least one caterpillar inside. 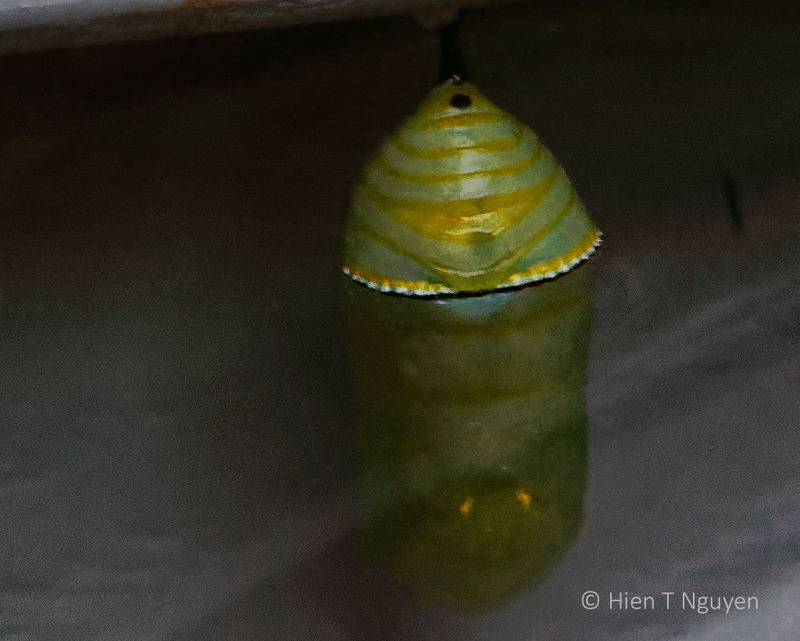 As of today, the Chrysalis is still there, and getting transparent. I think there is a butterfly shape in there, but it maybe too soon yet. It will get more and more obvious – take more photos! 🙂 Thank you. I just realized that I have never seen a monarch caterpillar before (or any type of chrysalis for that matter). It appears to have antennas on both ends of the creature – are my eyes fooling me? Beautiful thought-provoking shots. Your eyes are not fooling you at all. 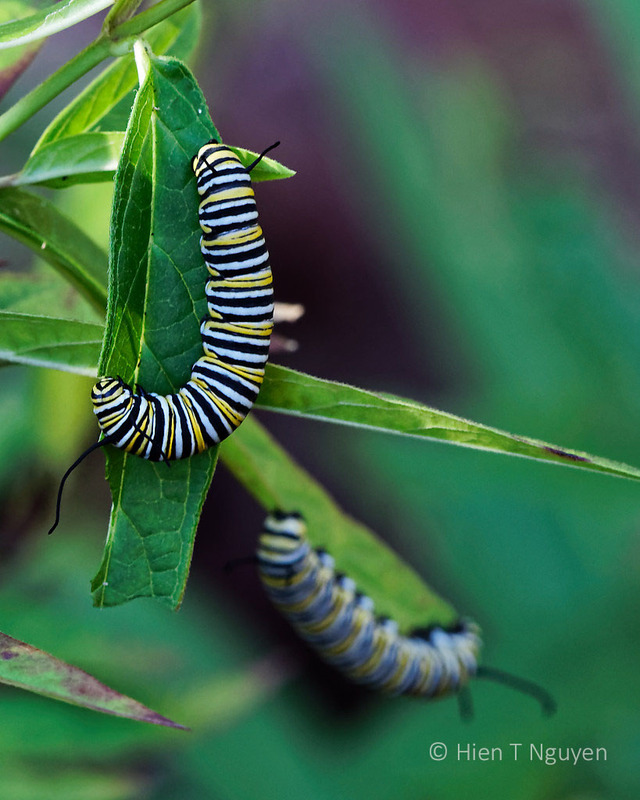 The Monarch caterpillars has antennas on both ends, with the shorter antennas being on its head. I had to look this up originally, since I couldn’t tell head from tail. I hope that you are able to see and record when the butterfly emerges from its chrysalis! Way back when I was a kid, I found a monarch chrysalis and was able to place it in a jar and bring it inside to watch. It’s one of the most magical things in nature to see the butterfly as it emerges! Thanks Jerry! I hadn’t thought about bringing it inside. If things don’t turn out well this year, I will try bringing the chrysalis in and putting it into a jar. At the New York State Fair this year I saw a demonstration of a monarch house. When You find the caterpillars, move them to the house where they can transform. In nature, once they are ready the caterpillars are very active and mobile. No telling where they will end up. Thanks Michael! Next year I may try that, and will find out how to do it in the meantime. The tenth day is September 30th. One more week from today. Oh how amazing! Holding my breath and hoping you can enjoy the special moment. Wishing you a lovely weekend ahead! Isn’t this like a mini miracle? You too have a great weekend. Thank you, Hien, thank you! Dries, this was completely unexpected! I was going to wait and try again next year. Thank you Eliza! This shows we should never give up hope, at least about the Monarchs. It is so amazing how that all happens. Thanks for this post. I hope the butterfly will emerge and fly away! Looking forward to the transformation. Great post and photos! Thank you.